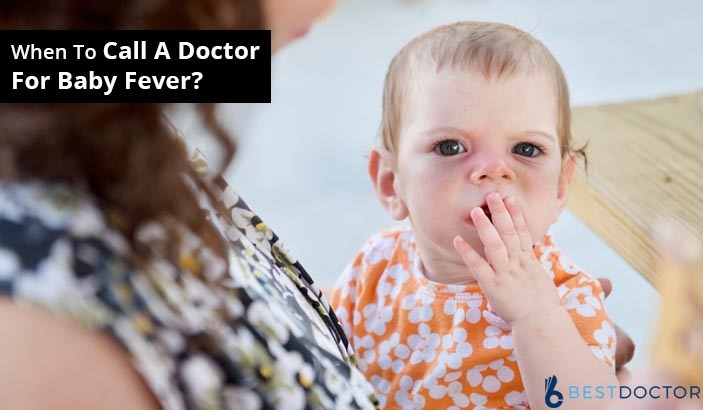 Home Blog When To Call A Doctor For Fever in Baby? Anytime kids get sick, parents often struggle with the decision to call a doctor or wait to see things out. Should the doctor be called for fever or not? Or should they call a doctor for baby fever after shots? When to make an online appointment with a doctor? And what is the dangerous temperature for a baby? These are some most frequent questions which confuse the parents. If your child has a tummy ache, cough or fever, there will be a time when you need to get advice from experts. A lot of people talk about how babies get feverish. But fever phobia among parents is a more common occurrence. Most parents get scared when their child’s temperature rise beyond normal levels. But, a fever might not be as bad as you think. There is a common saying that fever is a friend and not an enemy. The body temperature of a child goes up when a child gets an infection so that it can fight the viral infection causing the infection. Most infections are caused by viruses which do not have any specific treatment, so a fever can be helpful here. Fever is not an illness itself. Fever is usually a symptom or a sign of something else. Fevers can be caused in a baby by immunizations, overdressing and infections. Immunizations: Some children get a low-grade fever after an immunization. So, you may need to call a doctor for baby fever after shots. Overdressing: Infants could get fevers if they are over-dressed or left in a hot environment for a long period of time. They get fevers because their body temperature regulation is not yet as effective as older children and adults. Even if a child is overdressed, the child still needs to be checked by a doctor when he/she has a fever since a fever could be a sign of a serious infection. Infections: Fevers are usually caused by infections and other illnesses. Fevers stimulate natural defense mechanisms to help the body fight infections. Babies That Are Under Two or Three Months Old: You should see your doctor if your baby has a fever and he/she is still as little as 2 or 3 months old. Even if it is a little rise in temperature, you still need to see a doctor. Little babies have an immune system that isn’t fully matured, so an infection in a child that is as little as that is a sign of something more serious like pneumonia and bacterial meningitis. Babies That Are Older Than Three Months And Have Other Symptoms: If your baby has other symptoms like vomiting or a weak body in addition to the high temperature, then you need to see a doctor. If the fever lasts for over 3 days, you might need to make an online appointment with a doctor. Children That Have A High Fever: It is necessary that you call a doctor if your child’s temperature is above 104⁰F. This is a dangerous temperature for a baby. This advice is even more important if the child has other symptoms like diarrhea, persistent vomiting, trouble breathing and trouble waking up. When The Fever May Not Be Serious? For children with a fever that do not want to eat, you do not need to worry yourself. A lot of infections that cause fever make the child not to feel like eating. Children that still pee and drink normally will usually not eat as much as they normally do. Teething can also cause a child’s temperature to rise slightly. But if the child’s temperature is higher than 37.8⁰C or 100⁰F, it might be an actual fever and not teething. What’s the temperature of your child? When was the last time you took the temperature of your child? For how long as your child had a fever? Does your child have any other symptoms apart from the fever? Previous PostHow To Book Doctor’s Appointment Online? Next PostWhat Does A Rheumatologist Do For Fibromyalgia?